What are companies looking for in these alliances? First, the seal of approval of a third-party organization with environmental credentials can lend credibility to environmental initiatives in the eyes of skeptical stakeholders. Second, and perhaps more important, companies are forming alliances with environmental NPOs to acquire new information, knowledge, and the capacity to rethink business operations through an environmental lens. Like the university that hires an outside educational consultant rather than use the expertise of its own education department, management may overlook the environmental health and safety (EHS) staff as a resource for expertise on sustainability. This situation presents an opportunity for EHS professionals who have the technical backgrounds to readily climb the sustainable business learning curve. Environmental professionals who have a working knowledge of sustainable business practices and concepts will enhance the value of their companies. It may no longer be enough for environmental professionals to have technical expertise; they must also be able to "cross-pollinate" the technical expertise of environmental engineering with business strategies for sustainability initiatives. 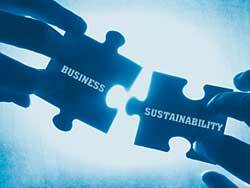 Those who have developed these capabilities are in a position to lead corporate sustainability initiatives. In a previous issue of Environmental Protection, Richard MacLean advocates that EHS professionals learn to demonstrate to management exactly how their departments support strategic business objectives.3 In this article I take this role change a step further. I suggest that EHS professionals become educators (in the true meaning of the word, educate: "to lead out") of business management and a source of knowledge that is critical to sustainable business strategy. To become a resource for management on sustainable business, EHS professionals will have to climb the learning curve. This can seem like a daunting task, as this relatively new field can seem like a garbage can of problems and solutions with no apparent logical connections. Typical problems may include hazardous waste disposal, site remediation, end-of-life product responsibility, water sourcing and waste, stakeholder management, etc. A word salad of acronyms describes a bounty of solutions, including, DFE (Design for the Environment), EMS (Environmental Management Systems), POEMS (Product-Oriented Environmental Management Systems, Supply Chain Management, LCA (Life Cycle Analysis), Green Chemistry, and others. What may seem like a dizzying array of sustainability problems and solutions can be understood, I suggest, through three underlying ideas. Each of these ideas points to opportunities for business to gain competitive advantage. Each idea drives innovation in product design, business models, and competitive strategy. I present each with illustrations of how business is putting the idea into practice and profiting. 1. We are in the midst of a second industrial revolution. Plentiful natural resources and scarce labor marked the first industrial revolution. Now the situation is reversed, with scarce natural resources and plentiful labor. How do we make economic progress in this new circumstance? 2. Capturing the business opportunity in "biomimicry" means eliminating -- not reducing -- the concept of waste. All industrial processes would then produce material that could be either biodegraded in an ecosystem or used as input in another industrial process. How are companies profiting from this new way of thinking? Practices supported by this idea include: recycling, take-back and extended producer responsibility, industrial ecology, life-cycle analysis, and product service system design. 3. Emerging markets are developing rapidly. Anyone can see, the thinking goes, that several planets would be required to absorb pollution and provide resources if China or India, for example, develop with an environmental footprint that is as large as that of the United States.7 How can the markets at the bottom of the economic pyramid be developed with a smaller environmental footprint? This idea supports the practices of developing "leapfrogging" and disruptive technologies, of eco-product innovation, and of rethinking marketing. Example: Volvo looked at the future and changed their identity from an automobile company to a transportation company. They noted the demographic trend toward urbanization. Their new corporate identity allowed them to see opportunity in urban transportation systems. They won a contract to build busses that form the backbone of the public transportation system in Curatiba, Brazil. This was not so much a technological breakthrough as a radical change in thinking. Volvo Group's CEO, Lief Johansson, described this strategy: "History cannot be allowed to repeat itself. The largest cities of developing countries need to develop a transportation industry without repeating bad history." In sum, the three-idea framework invites participants to think broadly, beyond tried-and-true practices like energy efficiency, to expand opportunities to prosper from sustainability capabilities. Most of the changes are not rocket science, but rather, a new mindset that sees business opportunity in sustainability challenges. EHS professionals who have educated themselves can become valuable resources to their companies, and they can lead business managers up the learning curve. Livesey, S. (1993) McDonald's and the Environment. Boston, MA: Harvard Business School Publishing. Rondonelli, D.A. & London, T. (2003) "How Corporations and environmental groups cooperate: Assessing cross-sector alliances and collaborations." Academy of Management Executive, Vol 17, No.1. Cited in Heller, T. (2004) "Corporate Education Programs for Sustainable Business: Communicating beyond the green wall." In Teaching Business Sustainability. Sheffield, UK: Greenleaf Publishing. Hawken, P. Lovins, A & Lovins, H. Natural Capitalism (1999). New York: Little Brown. Depicted in the video, "The Next Industrial Revolution: William McDonough, Michael Braungart and the Birth of the Sustainable Economy." This idea is developed in the article, "Global Sustainability and the Creative Destruction of Industries" by Stuart Hart & Mark Milstein, Sloan Management Review, fall 1999.